Due West is a country trio consisting of Tim Gates, Brad Hull, and Matt Lopez. The group is recognized for its distinctive harmonies. Each musician is a member of The Church of Jesus Christ of Latter-day Saints. The group formed in 2004 after the three met at a party hosted by Dan Truman, who brought together people in the music business and musicians trying to break into it. At the party, Brad Hull, a guitarist, started playing favorite country songs and Gates and Lopez joined him by singing harmonies. Listeners thought they were already a group. Due West was born. By 2006, the group was close to signing a contract with RCA Records Nashville, but the merger of Sony Music and BMG killed the deal. 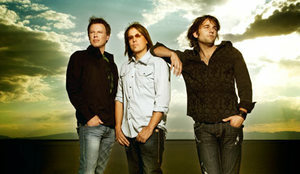 By 2009, Due West self-released its first single, “I Get That All the Time,” and created a music video that premiered on Great American Country (GAC). The group’s second single, “When the Smoke Clears,” was released as a music video in 2011. Both of the singles made it into the top 20 of Great American Country. “I Get That All the Time” was the highest-ranking single from a self-released act on the Music Row Country Break Out chart in 2009. The video made it to the #3 spot on the GAC Top 20 Countdown. During their concerts, the trio plays a song called "Tip Jar," and they have a tradition of passing a tip jar around for charities, and following their lead, the fans also give. For example, one night their audience donated well over $500 for the American Cancer Society while Due West sang the song. The group contributed “Everything Is Beautiful” to the Letters to God soundtrack. The song was created at the request of Tyson Busenbark, a teen suffering from cancer, to have a song written for his mother. This page was last edited on 25 January 2015, at 00:29.